Although dancers are often known as artists, in reality they should also be known as athletes. The demands of taking daily classes often leads to overuse injuries. The most common overuse injuries include the joints of the ankle, leg, foot and lower back. Injuries can also result from the dancer having poor form or technique. Additionally, young dancers who are going through growth spurts are more at risk for overuse injuries because their bones are the weaker making them more at risk for broken bones and stress fractures. Injuries to soft tissue including muscles and tendons can occur at this time because the dancer’s bones are growing faster than their soft tissue. Even though serious dancers may be at their dance studio four times a week taking multiple classes a day, dancers may need to consider cross training. Cross training in addition to taking class allows the dancer to improve core and hip strength. Cardiovascular training a few times a week on a stationary bike or swimming improves endurance for long performances. Other considerations for preventing injuries include proper nutrition, getting enough rest, proper fitting shoes and warming up prior to training or a performance. Although overuse injuries are the most common problem experienced by these athletes, acute injuries such as fractures, dislocations and sprains occur in dance. 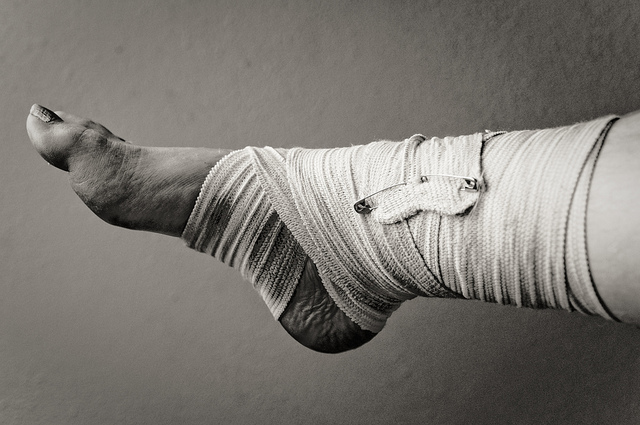 Ankle sprains often occur when a ballet dancers goes “en pointe” or on the tips of the toes. It is imperative that the dancer have correct form in order to prevent injuries. Young dancers should be watched to make sure they develop proper form. It is common for them to not activate their core or hip external rotators which causes extra strain on their lower back, knees, hips and ankles. An experienced dance instructor or Physical Therapist trained to evaluate dancers can identify problems with a dancer’s technique or form. If you are a dancer and experiencing back, hip, knee, ankle or foot pain have your instructor or Physical Therapist look at your form. There are many considerations in respect to a dancer’s form; however, two common assessments are for hip “turn out” and releve form. Sixty percent of the dancers turnout should come from the hips. Essentially that means that the deep hip rotators need to be strong. There are specific exercises that can isolate the hip rotators. Additionally, the dancer’s releve should be assessed. The stronger muscles of the calf including the gastrocnemius and soleus should be the primary mover when going “en pointe” versus the toe flexor or Flexor Hallucis Longus (FHL). Overuse of the FHL can cause tendinitis pain which can be debilitating and lead to time off from dance. The high athletic demands and specific form required for a healthy and optimally functioning dance body can be achieved with attention to detail and targeted strengthening program. This will help make the most of available training time and reduce possibility of injury. If a dancer is experiencing pain, a physical therapy evaluation by a therapist familiar with the demands of dance can help locate the source of the problem and rehabilitate the dancer for return with optimum performance. This informational blog is brought to you by the Belgrade Physical Therapy Professionals at Pro Physio. Please do not hesitate to call our office if you have any questions or would like to schedule an appointment for Physical Therapy. (406) 388-8118.